At the invitation of Men Sam An, Standing Deputy Prime Minister of Cambodia, the Sponsoring Association for Poor Patients (SAPP) in Ho Chi Minh City sent doctors to perform eye surgeries on poor people. Vietnamese eye surgeons performed operations on disadvantaged residents in the Cambodian districts of Prey Veng, Kongpongthom and Longpongcham with financial assistance of Long Thanh Golf Club. SAPP’s Chairman Tran Thanh Long told the mission group to perform surgeries and help save the sights of people. The mission group received a warm welcome from Men Sam An, her delegation and the local people at the border crossing of Dinh Ba in district Tan Hong of the Mekong delta province of Dong Thap. The local government had given prior information to residents about the eye camp and many had come from distant parts to avail of the facility. After the operation they returned to tell their neighbors how Vietnamese medics had helped their blindness and even gave them VND50, 000 cash as transport fee. After three days, the mission moved camp to Kongpongcham district where the doctors performed surgeries for four days instead of two days as scheduled. Kongpongthom residents hailed the Vietnamese doctors, complimenting them on their golden healing touch. 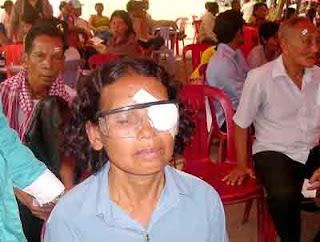 Of the 3,000 people registered for eye surgery, 1,714 patients were operated upon but the remaining were not able to, because of prolonged blindness or having been born blind or being too old to be operated upon. At the farewell meeting, Men Sam An thanked the mission, saying that she would convey to Prime Minister Hunsen and Deputy Minister whose fatherland was Kongpongcham and Prey Veng, about the successful trip made by the Vietnamese doctors to help needy eye patients.